You are making progress despite what appears to be a setback staring you in the face. Just stare it right back and remind people of the promises they have made the ideas they espoused and of their own best interests. Do so politely but clearly and firmly and you will get your way. 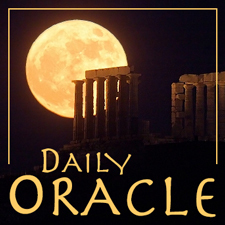 Today’s Oracle takes us to the Capricorn weekly for September 9, 2005. You are making progress despite what appears to be a setback staring you in the face. Just stare it right back and remind people of the promises they have made the ideas they espoused and of their own best interests. Do so politely but clearly and firmly and you will get your way. Keep in mind that certain individuals have a tendency to get high on conflict. Watch this tendency in yourself and make sure you don’t feed it a single scrap of your emotional energy. Only you can revive the spirit of cooperation that was so strong so recently.